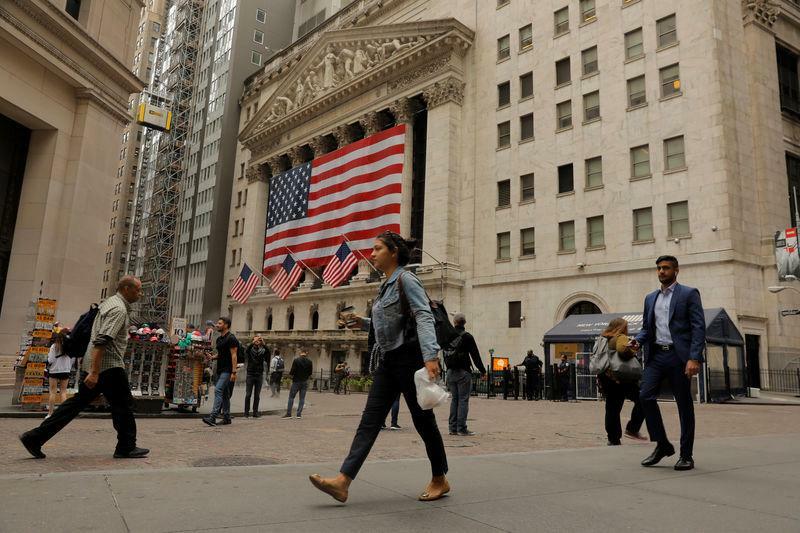 NEW YORK (Reuters) - Trade-sensitive industrial stocks led the Dow Jones Industrial Average to a record closing high on Thursday, the last of Wall Street's main indexes to fully regain ground since a correction that began in January. All three major U.S. indexes closed higher as trade worries subsided. Technology companies led the Nasdaq higher, along with the S&P 500, which also hit a new closing high. Microsoft Corp (MSFT.O) and Apple Inc (AAPL.O) rose 1.7 percent and 0.8 percent, respectively. The companies headed up the tech sector's 1.2 percent gain. The market took the ongoing trade dispute in stride, and was further boosted as the dollar index (.DXY) fell to its lowest in more than ten weeks. A weaker dollar supports U.S. exports. "When it's confirmed you're at new highs people see that as an all clear signal and they jump in," said Mark Hackett, chief of investment research, Nationwide in Downingtown, Pennsylvania. "There's no individual headlines that would cause it." Bernard Baumohl, chief global economist at the Economic Outlook Group in Princeton, New Jersey, agreed, but saw reason for caution. "The feeling is the stock market resembles a drunk at the top of a hill," Baumohl said. "He's wobbling and you know that drunk's going to fall but you just don't know when or how hard." The Dow Jones Industrial Average (.DJI) rose 251.22 points, or 0.95 percent, to 26,656.98, the S&P 500 (.SPX) gained 22.8 points, or 0.78 percent, to 2,930.75 and the Nasdaq Composite (.IXIC) added 78.19 points, or 0.98 percent, to 8,028.23. The last time the S&P and Dow hit record intraday highs without the Nasdaq following suit was Dec. 13, 2017. Of the 11 major sectors of the S&P 500, all but energy (.SPNY) ended the session in positive territory. Among the FAANG group of momentum stocks, Netflix Inc (NFLX.O) closed lower. The remaining FAANGs gained ground, with Facebook Inc (FB.O), Apple Inc, Amazon.com (AMZN.O) and Google parent Alphabet Inc (GOOGL.O), gaining between 0.8 and 1.8 percent. Nike Inc (NKE.N) rose 1.1 percent after an analysis of the company's online sales data by Thomson Reuters Proprietary Research revealed it had sold out of 61 percent more merchandise since the appearance the ad campaign featuring NFL player Colin Kaepernick. Shares of Under Armour Inc (UAA.N) jumped 6.6 percent as the sportswear company announced it was cutting 3 percent of its workforce as part of its turnaround scheme. Defense stocks, including Northrop Grumman Corp (NOC.N), Lockheed Martin Corp (LMT.N) and Raytheon Co (RTN.N) lost ground after the United States said it was ready to resume talks with North Korea after Pyongyang pledged to denuclearize by 2021. General Electric Co (GE.N) slipped 3.1 percent after reporting problems with its new power turbines, prompting J.P. Morgan to lower its price target. Advancing issues outnumbered declining ones on the NYSE by a 2.15-to-1 ratio; on Nasdaq, a 2.68-to-1 ratio favored advancers. The S&P 500 posted 43 new 52-week highs and no new lows; the Nasdaq Composite recorded 58 new highs and 44 new lows. Volume on U.S. exchanges was 6.88 billion shares, compared with the 6.31 billion average for the full session over the last 20 trading days.